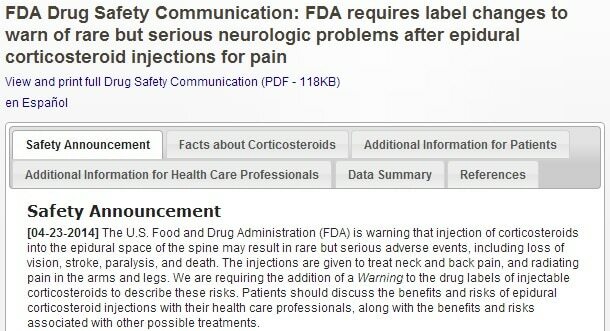 The U.S. Food and Drug Administration (FDA) is warning that injection of corticosteroids into the epidural space of the spine may result in rare but serious adverse events, including loss of vision, stroke, paralysis, and death. The injections are given to treat neck and back pain, and radiating pain in the arms and legs. We are requiring the addition of a Warning to the drug labels of injectable corticosteroids to describe these risks. Patients should discuss the benefits and risks of epidural corticosteroid injections with their health care professionals, along with the benefits and risks associated with other possible treatments. Back pain has also been noted by the Global Burden of Disease 2010 report as a leading cause of disability worldwide. While this condition has the potential to become chronic, sufferers should not take the risk of putting themselves in further danger by seeking potentially harmful corticosteroid shots and other chemicals to get relief from the unbearable discomfort. Drugs and invasive procedures take years of clinical trials before getting regulatory approval and face constant review to ensure that they are safe for public use. Because chronic back pain will not wait for a wonder drug or a miracle procedure, patients should be more open to the safer treatment chiropractors in Brick, NJ offer: manipulation. Manipulation, along with exercise and therapy, is a core back pain procedure derived from chiropractic techniques that relieve spine and back pain. Besides being chemical-free and non-invasive, this type of treatment induces the body’s natural ability to heal itself. 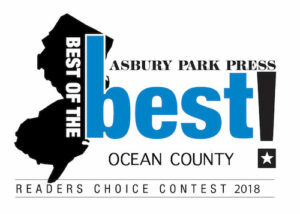 A trusted chiropractor in Brick, NJ, such as Dr. Theodore M. Koziol of Back and Neck Center of Brick, LLC., has extensive knowledge and years of professional experience to perform a safe manipulation procedure. Specialists make use of tools such as taking x-rays to ensure that patients are not in any danger when getting treatment. Consulting with competent chiropractors over a period of few years has resulted in gradual and long-lasting back pain relief for many patients. As regulators are still reviewing whether the benefits of using drugs and other chemicals outweigh the risks, the general public can turn to chiropractic treatments and procedures to relieve back pain.